Why noon is really 3pm……….. Noon traces its origins directly to the Latin adjective nona, which was used to refer to the ninth hour of the day. 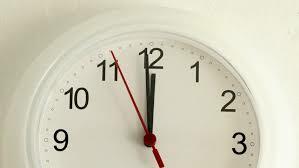 Since the Romans set daytime hours as those from 6 a.m. to 6 p.m., the ninth hour was actually 3 p.m.
As the influence of the early Christian church spread across the lands bordering the Mediterranean Sea, it adopted Latin as its language, the most widely spoken tongue at the time. To name the order of the prayers read by priests around 3 p.m., the church leaders chose the term nones, a variation of the Latin nona (hora), meaning “ninth hour.” When the church leaders moved the time for the special prayers back to 12 p.m., they did not change the term nones because it was too closely associated with the prayers. In time, nones began to signify both the prayers and the time of day. Later, its form became the “noon.” we use today. Previous PostA very short history of 16th century manners…..
Next PostA very short history of wallpaper……..